Much is changing in Windows 10. Chief among these is a driven move from the old Control Panel that we all know so well, to the new-look, touch-friendly Settings. Today, we want to discuss what is changing from Windows 8.1 to 10. Microsoft is making substantial interface changes in Windows 10 and while the Control Panel is still alive and well, it seems the writing is on the wall for it. You will still be able to find almost all the old control panels to which you are accustomed, but some have been renamed, some eliminated, while others migrated to Settings. The Windows 8.1 Professional Control Panel on a desktop computer. If you compare the current Control Panel in Windows 8.1 (pictured above) to the newer one found in Windows 10 (below), at first it doesn’t seem like there’s much difference between them. Truthfully, there really isn’t, but several key items have been renamed or moved. Windows 10 on a Samsung Tablet adds a few Control Panels that aren’t on the desktop version, but all the other essential ones are still there. With Windows 10 so close to its July 29th release date, we suspect little else will change in the Control Panel before then, and this would be a good time to discuss what you need to know about the Control Panel in Windows 10; namely what has been renamed, removed, or moved to Settings. The new Control Panel is almost exactly the same as the Windows 8.1 version with some notable exceptions. Note also, the icons have been redone, and it’s actually nice that Microsoft finally paid some attention to them. Remember the Action Center, where you can check out all your security and maintenance needs? The Action Center has not gone away, it has simply been renamed to appropriately, “Security and Maintenance”. Given how little we actually use the Action Center (like ever), this is a minor thing, and nothing appears to have changed with the actual control panel itself, so it’s just the Action Center with a more accurate name. The “Add Feature to Windows 8.1” control panel is gone and there’s no “Add Features to Windows 10” equivalent to succeed it, which is great because this control panel was always pointless. There’s no need for such a control panel anyway since Microsoft has a whole store through which to sell products, though that hasn’t always turned out so well. The old Windows 7-style backup and restore Control Panel has returned in Windows 10, at least for now. In Windows 8.1, the focus was on File History, though you could still make system images and repair discs. File History is still an option if you want to continue to use that for incremental backups. The old Family Safety control panel merely gave you a link to the Accounts settings wherein you could set up a child’s account. This child’s account can then be monitored by Microsoft Family Safety. The Family Safety control panel has been removed, though you can still set up child accounts in the Accounts settings, which you can then presumably monitor with Microsoft Family Safety, if you desire. Folder Options is another control panel that has been renamed. 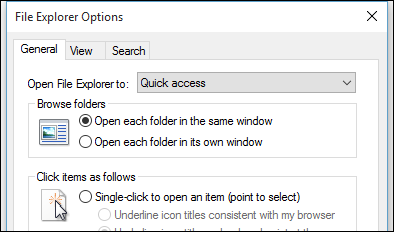 Formerly “File Explorer Options” the new control panel does exactly the same thing as the old one. This control panel has remained largely unchanged for the past several Windows versions. It’s unlikely to actually disappear anytime soon since it is so tightly linked with the desktop and File Explorer. Location is one of those control panels that has been entirely migrated into the Settings. You can find the new Location settings in the Privacy group along with options to change other privacy settings on the camera, microphone, and other items. For the longest time, you’ve been able to change which icons and notifications appear on the taskbar using the appropriate control panel. This however, has been completely removed in favor of the new notifications settings, which can be found in the “System” group under “Notifications & actions”. It’s not remarkably different from the old control panel version. You can show all the icons at once, or go through and turn them “Off” or “On” one-by-one. Finally, last but not least, Windows Update has been completely removed, revamped, and integrated into the Settings. This is perhaps the biggest change to the Control Panel and might confuse some who are used to manually updating their computer via the old Windows Update. It basically works the same way, so you shouldn’t have a problem becoming accustomed to it. Beyond this, as you go through and explore the new Settings in Windows 10, you will see that you can do many of the same things there as in the Control Panel. For example, just in the “Update & Security” settings alone, you will notice there are options for Windows Defender as well as Backup. Whether or not Microsoft removes the corresponding control panels for things it’s already migrated to Settings, remains to be seen, but we can surmise they will continue to convert more and more control panel functionality into the Settings. Unfortunately, it won’t be soon enough for annoyances such as notification alerts, which must still be configured using the Sound panel. If you would like to weigh in on what you think of Windows 10 so far, we encourage your feedback in our discussion forum.